What matters most to the U.S. is that the unrest is contained. The United States’ current policy toward Central America is pretty simple: increase border security to stem uncontrolled migration flows and offload as much responsibility as it can to Mexico. It offers some Central American countries basic security cooperation when it has to, but otherwise, Washington prefers to keep its distance. If Nicaragua stays on its current course, distance may not be a luxury the U.S. can afford for much longer. Given how quickly Nicaragua’s security situation deteriorated, it’s easy to have missed – or to have forgotten – how it got as bad as it is. And it’s bad: Nearly three months in, the protests and violence show no signs of abating. They began on April 18, when President Daniel Ortega moved forward with plans to increase the contributions of workers and employers into the beleaguered social security system. The International Monetary Fund has been warning the government in Managua for more than a year that its social security system is dangerously low on funds as a result of years of mismanagement. After the first few days of unrest, Ortega reversed course, but it was too late to put the lid back on. Anti-Ortega groups had already seized on the controversial reforms to spark nationwide, anti-government protests. Students and pensioners have been joined by business groups, Ortega’s political opponents and nongovernmental organizations, each promoting its own cause but united in their opposition to the government. The protesters haven’t accomplished their objective of ending the Ortega administration, but they have succeeded in sending the economy on a nosedive. Before the protests started, the IMF projected 4.3 percent economic growth for Nicaragua. The country’s central bank was more optimistic, forecasting growth of 4.5-5 percent for 2018. At the end of May, however, the central bank revised its projection down to 3-3.5 percent. On June 29, the bank’s president dropped expectations further, to just 1 percent growth. The bank also noted that foreign direct investment in the first quarter had fallen 27 percent year-on-year to a mere $322.3 million, and it revised projected unemployment to 6 percent from 3.7 percent to account for an estimated 85,000 lost jobs. Those are the optimistic assessments. The Nicaraguan Foundation for Economic and Social Development released in June an updated assessment of the country’s economic losses in the event the protests continued. It concluded that 215,000 jobs had already been lost – 2.5 times the central bank’s estimate. It also reported that in the best-case scenario (i.e., the crisis gets resolved by the end of July), the Nicaraguan economy would still contract 0.3 percent this year, and economic losses would total approximately $637.9 million. In the worst-case scenario (i.e., the crisis continues throughout the end of the year), the study estimated that the economy would contract 5.6 percent and see up to $1.4 billion in losses. All indications right now suggest that the protesters won’t back down, the government won’t resign and the economy will continue to deteriorate. Several attempts at dialogue have ended in failure. The protesters have called for early elections, but the opposition has not yet presented a viable alternative to Ortega – and on Saturday, Ortega ruled out elections anyway. With dialogue and democracy off the table, one of the only options that remains is force. Here, too, there is stalemate. The government has unleashed paramilitary groups on the protesters, but the protesters have proved resilient. A political organization known as the Broad Front for Democracy called on the military to disarm the paramilitary forces, but those calls have been ignored and likely will continue to be. But neither will the military put its thumb on the scales to defend Ortega. The Nicaraguan military was professionalized during the 1990s and is legally bound to the country’s constitution, not its president. Ortega has tried to politicize the armed forces since taking office in 2007. He favored loyalists for promotions, increased the presidency’s authority over the military and allowed officers to hold executive branch posts. He also bought loyalty with pay raises – something made more difficult since then by government austerity measures. Nevertheless, the institution of the armed forces has held steady and has respected the boundaries when it comes to domestic affairs. So long as Ortega has paramilitary groups policing demonstrators, this arrangement Works. 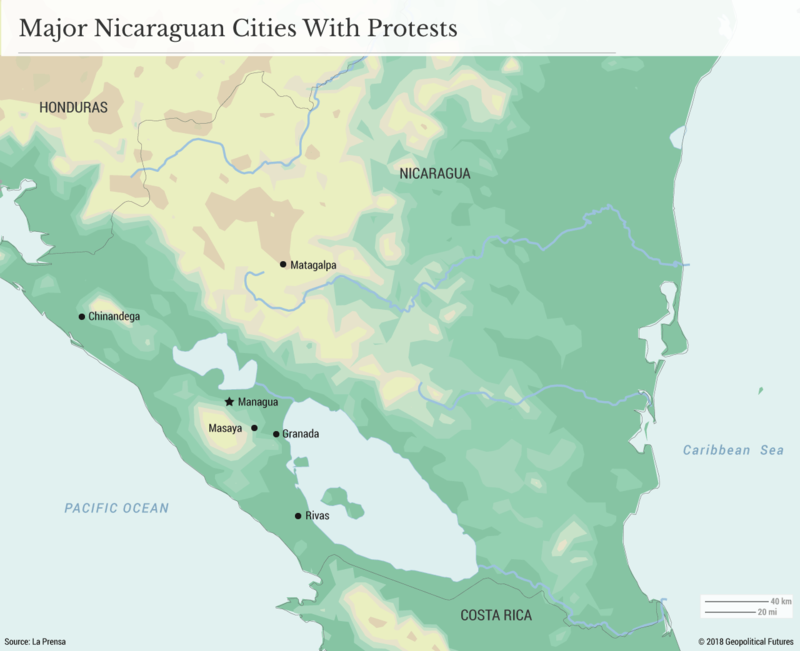 Nicaragua’s descent into chaos makes the population vulnerable to lawlessness, particularly gang activity and drug trafficking, and encourages mass migration. 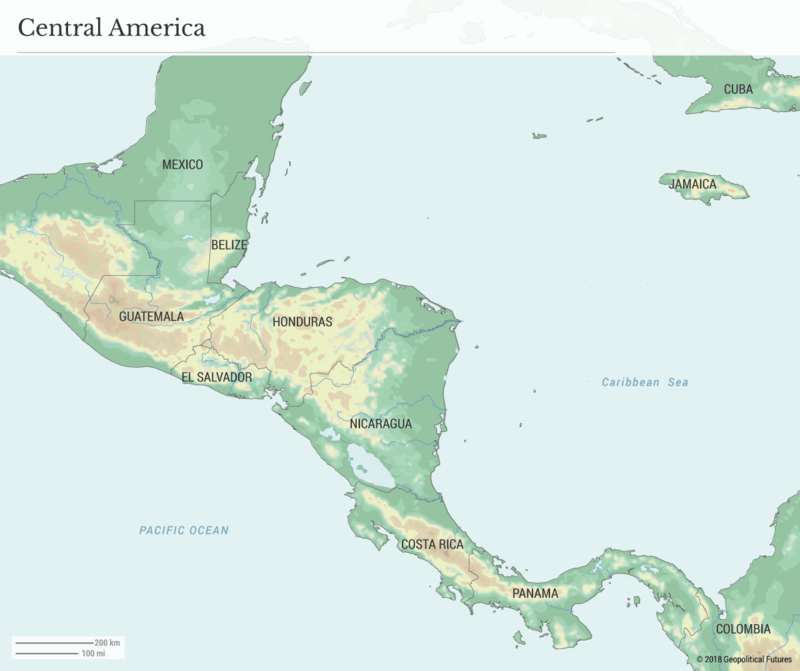 The U.S. has generally been able to overlook Nicaragua, focusing its attention instead on containing migration from the Northern Triangle countries: Honduras, El Salvador and Guatemala. These countries have poor economies, a high prevalence of gangs and complicated recent histories fraught with violence. Nicaragua has largely been an exception, with minimal drug trafficking and a budding basic manufacturing sector. Though there hasn’t yet been an exodus from Nicaragua, neighboring Costa Rica has observed an influx of refugees. Their numbers will only grow the longer the instability lasts. And Costa Rica – which is dealing with its own financial problems as well as an increase in drug trafficking through its territory – is in no position to handle a flood of refugees. It is a long-standing U.S. ally that relies heavily on the U.S. for security. It would expect Washington to provide some assistance should things get worse, and failure to do so would damage a critical U.S. relationship in the region. These measures alone will not bring down the Ortega government, and that is fine with Washington. The U.S. does not want to devote an abundance of resources to deal with the issue. It understands the potential for Nicaragua to further exacerbate the problems the U.S. confronts when dealing with Central America. Washington will avoid any decisive action unless it’s absolutely forced to act. In the meantime, it will encourage regional actors to assume responsibility and will gradually apply diplomatic and economic pressure on the Ortega government. The most important element of U.S. strategy toward Nicaragua isn’t that the Ortega government is demolished – it’s that whatever happens is controlled.